As people rush to join the cannabis industry, products are similarly flooding the market. It is exciting that there are so many players coming to the table, but the result is a seemingly endless stream of edibles, vapes, concentrates and of course a bunch of flower (that is grown better than any flower you have ever had in your life because every grower is the best grower that you have ever, and will ever, encounter). It is not everyday that you come across a cannabis product with real differentiation. BrewBudz surprised me. Brewbudz is inspiring because it provides a glimpse into where the industry is headed. It is undeniably a product to watch. I met Kevin Love through an old friend. Through BrewBudz, Kevin and the rest of the BrewBudz team are really harping on the importance of social responsibility, and rightfully so. The whole cannabis legalization argument has been based on the good that it will do for individuals, for society, for the economy and for the world as a whole. It would be blatantly hypocritical to achieve legalization only to create a harmful industry. We love finding the companies like BrewBudz that are moving this industry forward while keeping the original heart of cannabis in mind. Kevin and I caught up about BrewBudz, and we also touched on what it will take to take part in directing the cannabis industry, what it means to be a “good-for company,” and some tips for people looking to enter the cannabis industry. CM: Hi Kevin!! I’m glad we get to do this. 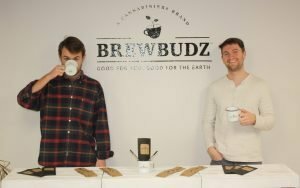 As you know, Cannabis Magazine is really taking off and it makes I think it’s perfect timing that we get to feature BrewBudz which is also taking off right now! SO excited to learn all about what you guys are doing with BrewBudz. I know you guys recently went viral after a conference in November, so now that people know about Brewbudz, we are stoked to have you here so people can really get the back story behind this viral worthy brand. We want people to get to know the people behind the products in the cannabis industry. Before getting into the company too much, can we start by diving in a little bit more about where you’re originally from and where you’re living now? I grew up in a pretty small community in New Jersey. It was me, my parents and my bother and sister. I am the youngest of the three kids. I went to a Catholic school, I played sports my entire life, and of course attended the DARE program in 6th grade. Within the small Jersey community, the idea of consuming cannabis was very, very negative. The only thing the DARE leaders spoke about was smoking weed and how bad it was. CM: Maybe they thought that if they could keep you from the “gateway,” well then they didn’t have to tell you much about the perils of beyond? Kevin: (laughter) Yes. They didn’t call it cannabis, it was always “smoking weed” and the catastrophic effects that it could ultimately have on you. Like being a gateway drug, that was a really popular thing for them to say. To be honest with you, I was always very scared to even engage with cannabis. CM: So, what changed? Now you are a cannabis industry entrepreneur so your view of cannabis shifted at some point. Can you pin point when and why that occurred? Again, I’m in this environment where, cannabis is considered to be very taboo. Although a lot of people that worked in my office would consume, it would never be a topic of open conversation. East Coast versus West Coast mentality I guess. CM: Can you elaborate on the coastal difference in seeming tolerance of cannabis? That’s so interesting that the reactions strongly differ from coast to coast. I definitely have heard from others that a lot of the Wall Street crowd can be pretty stuffy when it comes to cannabis. I think when Mike Hayford and I started talking about this idea of BrewBudz, I had a little bit of reservation just because of my environment up to that point. I had to consider my status working on the East Coast, and in finance. Cannabis just never aligned with who I was as a person, or at least that’s what I thought at the time. CM: Is Brewbudz your first cannabis venture? Kevin: Yes it is. I worked with the founding team to help develop the product. CM: So, what was it that changed your mindset about cannabis so much that you joined a cannabis company? Kevin: Honestly, Brewbudz is what changed my outlook the most. Once the idea of BrewBudz came along, I started doing a lot of research about the power of cannabis as medicine, and what it can actually do. Doing my research I learned that a lot of the things that were taught to me from an early age were incorrect. They would pick those points of information that are supposed to scare you, or are negative about cannabis, and just force it down your throat. Kevin: It is propaganda, exactly. I hate when people call it a drug now. “Drug” kind of has a negative connotation. It really is a medicine. If you decide to use it more for a social purpose, or a recreational purpose, that’s fine. But just look at the value add that it can have for people that are dealing with sleep apnea, or stress, or anxiety, or joint pain, or muscle pain, inflammation, whatever it may be. CM: You made the move to join the BrewBudz team in developing a concept for a product that aligns with some of the most mass-consumed products in the world (coffee & tea). What are your next steps? Kevin: Nevada is going to be our initial launch market. Then, we’re going to be in Colorado, California, Washington, Oregon, and Arizona in the next, probably four to six months. Then subsequent to that there’s another 11 territories that we’re going to be moving into, which we hope to have establishments in the next year to a year and a half. CM: That’s exciting! What a lot of people don’t consider is that multi state distribution is so different in this industry than in others since product can’t travel across state lines. Which means that for now you have to have a local production facility in each state in which you sell product. That’s a lot of partnerships to build and maintain! CM: How has that experience been so far? Kevin: It’s really challenging to manufacture in this industry, because you can’t centralize manufacturing and then distribute to other states. Each state that you go into, you really need to create a new manufacturing model and find new partners to help execute on your plan if you’re not a license-holder in that state. The only state where we have crossover of holding a license is Nevada. It is a very quick market where we could draw up a contract between our existing production license and BrewBudz, and essentially start manufacturing our product right off the bat without having to go through a long strenuous contract negotiation with the license holder. CM: Now that you are in the production stage and Brewbudz is available in some dispensaries, before addressing all that there is to look forward to, can we look back for a moment to before BrewBudz was created? What was the initial driving inspiration behind BrewBudz? What’s the “why”? Kevin: I know that we always wanted to get into the cannabis space. It’s a very competitive market, and the barriers to entry are somewhat significant. We knew we had to have a product that could compete. Then we looked at the coffee market in general, just in traditional consumer markets. 61 percent of Americans consume coffee daily. Over 400 million cups are consumed on a daily basis in this country alone. CM: What?! That is so much coffee. Kevin: Then once you factor in tea, tea is the third most consumed beverage in the world. To us it made sense to combine cannabis with a product that is already proven attractive to adult consumers. Kevin: The top 3 consumed beverages are water, coffee, tea. The cannabis market didn’t have a product that filled in that gap that was … I’ll just say there was no product that was delivering in that absent gap in the market. CM: Maybe no company in cannabis is sufficiently delivering, but you guys do have some competitors. The compostable pod and packaging are important because any similar product out there is using the traditional K-cups, and doing nothing but adding to the environmental catastrophe that is K-cups…5 billion, 15 billion? 15 billion K-Cups ended up in our waste stream last year alone. But they never break down. What we decided to do is two things. We wanted to fill this open gap in the market for coffee and tea products and we wanted to do it in a socially responsible manner. Having a traditional K-cup wouldn’t have been exercising social responsibility. We could’ve gone with a biodegradable product, which is net neutral, or we could’ve gone with a compostable product, which is a eco positive. We decided on eco-positve, a compostable pod that actually breaks down into fertile soil. You put this in your composting bed, and within 180 days, 200 days roughly, this will be soil that you can repurpose in your garden. CM: It sounds like the idea of being eco-positive is pretty strong for you. 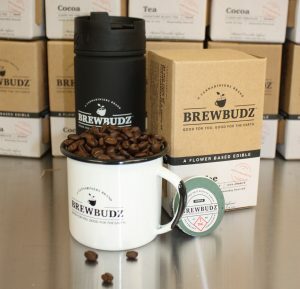 Brewbudz compostable Packaging is eco-positive. Traditional K-cups…not so much. Kevin: Well all of our packaging, if it’s not compostable or recyclable, then what are we doing? We’re nullifying the benefits of this compostable pod. Then we started looking at packaging options and we decided to do a compostable outer package. CM: What’s the BIG picture, large scale vision with the compostable elements? There has to be more to it than brand differentiation. Kevin: We’re positioned in this young market to help bring an identity to this market. The passion of this industry has always been there, but the definition hasn’t. The way people define this industry is very different from each person you ask. Outsiders looking in, insiders looking out, old school consumer and new school consumer, the definition just isn’t there. The passion got us through 28 states of legalization and will continue to drive those efforts, but how are we going to define our industry? What other industry can you actually have that influence over? Only industries that are in development, and in their infancy stages, and that’s where we are in this industry. In order to accomplish that goal, we wanted to be very circular in our approach. Our favorite thing is “Start right, stay right.” How can we draw in the influence of an entire industry to be the good-for industry? We are the good-for company, but now we want to draw in everybody to be the good-for industry. CM: One hundred percent. It’s vital to have a larger vision in the industry if you really want to make an impact. There are many companies that seemingly throw something together and enter the industry pretty recklessly. I love any company that has well defined purpose and values. Yes, go ahead and take your shot at making tons of money in cannabis, but have some kind of real strategy and purpose behind it. Kevin: We invested a lot of capital in this. Even down to the coffee that we put in the BrewBudz pods and the tea that we source, we’re putting a Ethiopian coffee in here. But we’re sourcing of coffee from Ethiopia, which happens to be the birthplace of Arabica coffee in 820 AD. While back. Kevin: You know, coffee starts off as a cherry. Within that cherry you get the green bean, and then you roast it and you get the black coffee beans that we are all familiar with. Kevin: (Smile) Yeah. He’s like, “What’s going on with these goats? !” So he grabbed all these cherries, and then he discovered coffee. That all happened in Ethiopia. CM: BrewBudz is sourcing from the motherland of coffee. There is often concern about the exploitation of the people from these third world countries and the exploitation of their natural resources. But being a good-for company, I’m hoping that’s not the case with the way you guys operate… Are you giving back to the community as well? Doing some good for the environment, the community…? Kevin: We are being very conscious about being respectable and responsible. CM: Well said! Along with being a good-for company, I really dig that BrewBudz is lifestyle integrated. BrewBudz infused a product that people consume on the daily anyway, and you’ve dosed it moderately so it’s like an enhancer. Essentially you can have your cuppa BrewBudz tea or coffee or cocoa and still function throughout your day. Do you foresee any other products you guys might create down the road that would be similarly lifestyle integrated? Kevin: Of course. The thing you have to understand is, we have a patented extraction process. We put 100 percent flower in here, and then we used a self-emulsifying bonding agent to help infuse all the cannabinoids and terpenes in the underlying ingredient, whether it’s coffee, tea, or cocoa. Taking that same concept, you essentially have the ability to create infused liquid. You can put anything in here, any underlying ingredient, and the output is going to be cannabis infused with that underlying ingredient. If you look at it on a larger scale, using the same technology we can create this big production. That is what their technical term is, where we can create cannabis water. Then cannabis water can be a way you infuse other beverages. But being a good-for company, we want to make sure that we’re good-for the consumer as well, not producing any sugary or artificial beverages. CM: That’s a big issue I have had with edibles. How many sugary products can one demographic endure while still claiming to be health conscious? I get that people don’t like the taste of cannabis extract, but for sure there are ways to infuse healthier products and mask the taste pretty well. Kevin: The BrewBudz team is working with this guy John Harrison from The Tea Gallery out in San Diego. He was here all last week doing experimentations. We’re sourcing all of our tea from him, and he hand-makes all his tea. If you have peach tea, or a raspberry tea, he’s taking actual peach and cutting it up and freeze-drying it to turn it into tea. CM: So kind of like Teavana teas where you can see the actual leaves and dried fruits. Taking that and infusing it with cannabis? Kevin: Exactly. And the fruit is a natural sweetener and naturally couples with cannabis in a way that masks what some consumers feel is an unpleasant taste. John from The Tea Gallery does cold brews, and hot brews, and the cool thing about it is, it’s 100 percent natural. It’s just natural ingredients. He’s putting the tea leaf in there along with all the other flavonoids, and then you run the brew cycle and you have this delicious, healthy, no sugar added, output. CM: What struggles have you faced in coming to market? Kevin: Not many! People are really responsive to the brand and retailers are excited to carry the pods. The most intense obstacle has been the actual product development and negotiating with production partners. CM: BrewBudz is ruling the game on the beverage front for sure! I’m going to pivot a bit here. I know that as an entrepreneur it can be difficult to separate yourself from your company. I think it is really important to understand the people who are driving the industry as well. Let’s get to know you a bit more. On a personal level. I have a feeling that your story has a to to do with where you see the cannabis industry heading. Aside from what inspired the company as a whole, what inspired you as an individual to dive from finance to cannabis? That’s a shift that might surprise a lot of people. Kevin: My brother Dan was always this humanitarian at heart, very altruistic person. At 30 years old he was like, “I’m done working in Manhattan. Do you know what I’m going to do for the next 27 months? I’m going to join the Peace Corp.” Peace Corp at 30 years old, and moved to Armenia. He’s been living in Armenia for the past year at this point, and he still has another year and a half to go. CM: Your brother’s leap of faith inspired you. Kevin: Seriously, it was like an epiphany. CM: What was the epiphany exactly? That you needed a purpose, more of a purpose driven life? Kevin: Yes, that I need a purpose. You can’t just do something that really has no benefit to mankind. It’s just doing a job to get to an end. CM: How has the purpose that the cannabis industry provides affected you in your life over all? Kevin: Right. It’s a crazy question, it’s a great question. I’ve actually noticed a much more positive outlook on life. I grew up in a very entrepreneurial household. My father took a big risk back in ’01. He left a very well-paying, not very well, but decent enough paying job to support the family, and started his own business. He always kept me very, very close to the source of his organization, because as he would put it, the education I received from him growing up had more value than getting a master’s or an MBA in school. An MBA or Master’s degree will tell you all of the components of how to build a bike, but they don’t actually say, “Okay, go ride the bike.” Riding the bike is real-life experience. I got to ride the bike from a pretty early time in my life, seeing this up-and-down, up-and-down of my father’s entrepreneurship. They ended up overcoming it because they believed in what they’re doing. They never missed payroll. He had over 100 employees working for his organization, and he always did the right thing. He found a way to overcome that massive challenge, and he ended up selling his company in 2011, 2012, and just seeing the highs, the lows, the persistence, not bringing it home to my mom because he didn’t want to make her fearful of what was going on. That really has always resonated with me, and I’ve always wanted to do something similar to the path that he’s walked in life. CM: He was purpose driven. Kevin: Admirably so. Anyway, back to the question of how being in the cannabis industry has impacted my life over all. I don’t think I would’ve ever been happy continuing on that path that I was going on. It wasn’t for me because of my upbringing, and seeing just my dad’s entrepreneurial spirit. Now that I am in the cannabis industry I feel a lot more positive, a lot more ambitious about the future. I’m really grateful that I’m empowered to be able to provide good for people through our humanitarian outreach programs while acting as a symbol within this industry to help assist the development of its reputation. It’s really empowering to know that a few of us can shape the future of this industry, and shape it in a way that will allow for it to sustain and be viewed positively. CM: Wrapping up, let’s touch base with any hopeful cannapreneur or interested investor. Now that you have some experience operating in and contributing to the direction of the cannabis industry, what advice and guidance would you give to the incredible amount of people who want to get into this industry? Kevin: I think the advice would vary based upon who the audience is. As a business owner I think the most important piece of advice would be, just do it for the right reason. That’s our whole concept of start right, stay right. If you’re trying to create a business within this industry with the wrong intentions, don’t bother. If you’re in this industry with the right intentions, and you’re providing a great product that you know will benefit the community, then you’ll persevere, you’ll make it through, because people will understand the why of who you are, and not just the what. CM: And how about those just getting in on the ground floor? Kevin: For someone up and coming, wanting to become a budtender or break into the industry on an entry level, you have to trust that there is opportunity. The most important thing is just focusing on your job that you currently have in front of you. I know a lot of budtenders see the opportunity, and they want to seek a bigger better deal. “I did this for six months, I earned my stripes, now I’m going to try to become a manager at another dispensary,” or whatever. I think staying consistent and just being the best that you can be every day is ultimately going to provide you an opportunity to advance further. CM: Have you seen this play out in real life for people on the ground floor? How has it been with managing the BrewBudz staff? Kevin: We see it everyday. That’s where opportunity comes – with passion. The best advice I can give once you get in on the ground floor is continuing with what your job is currently, and knowing that there is opportunity, unlike any other industry. Don’t try to rush it, and you’ll get to where you’ll want to be ultimately by the sheer fate of what this sector can offer you. CM: That’s good stuff. Thank you so much for sitting down with me and sharing your story and the story behind BrewBudz. I really believe in this company a lot, especially after sampling the product. I know the whole Cannabis Magazine crew is looking forward to seeing the progress you guys make within, and for, the cannabis industry. Kevin: Thank you for having me. Hope to see you again soon.